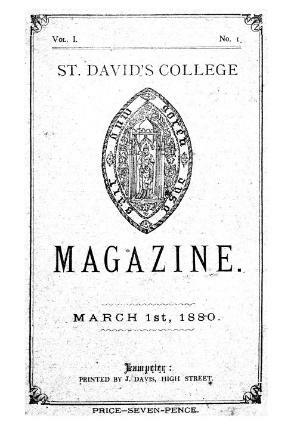 The periodical of St. David's College, Lampeter, that mainly published college news and articles on college life, religion, education and travel. Originally a trimonthly publication it was published annually between 1920 and 1933. Amongst the periodical's editors were John James Lias (1834-1923) and the college principal, and later bishop of Chester, Francis John Jayne (1845-1921). Associated titles: St. David's College and School Magazine (1888); The Wasp (1935); The Lamp (1936); The Lampeter Magazine (1938); Gateway (1947).